Have a question for Dr. Barbara? Feel free to ask in the comments! 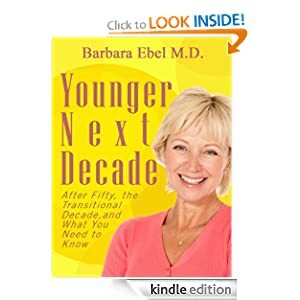 An excerpt from Younger Next Decade: After Fifty, the Transitional Decade, and what You Need to Know by Barbara Ebel, M.D. My husband and I have dogs, one of which is a Chesapeake Bay retriever named Chester. He’s a therapy dog, the star of a children’s book series, and my children say he’s so smart, “it’s scary.” A few days ago, we started out the day like usual. We got ready to walk and Chester sprinted around the house with a couch pillow that has become his. He politely ran up and down the hallway and whenever he stopped and waited, he placed the pillow between his paws and sank his muzzle perfectly on top of it. It’s always obvious he thinks better than to rest his canine head on the wooden floor. Yes, that’s how this smart dog is living his whole life – with spirit. The perfect word. If we humans carry a vitality and an enthusiasm for life, and an understanding of this gift called life, and if we experience our existence as much as possible with a positive outlook and joy; well, I think that’s called spirit. Have you ever noticed the difference between someone’s attitude who’s living life to the fullest versus someone who is just going through the everyday motions? I noticed it with my own mother. As she grew older, she became more socially active and independent. Into her seventies and eighties she looked more gorgeous than ever. She actually looked older in her fifties. Her spirit had developed and everyone around her saw and felt it. Now, just another word. You may be saying. “Sure, that’s easy in principle, but you can’t have spirit when you have a half-dozen big problems on your plate.” You are partially correct about that. But take it from someone who’s been told “you’ve been through hell and back.” Life does have its ups-and-downs. Do everything you can to weather those times – purposeful distractions got me through – and remember that inside you is a fundamental spirit that no one can take away that you must take every opportunity to flourish. Water yourself like a rose, from inside. Barbara Ebel is an author of fiction novels, children’s books, and Younger Next Decade. Since she is a physician, she sprinkles credible medicine into the background of her novels and her operating room scenes shine since her specialty is anesthesiology. However, her characters and plots take center stage. She wanted to pen Younger Next Decade because of the specific fourteen subjects/chapters and refreshing ideas she wanted to present to women and men over fifty. Please visit her at http://barbaraebel.weebly.com for more information, books, video trailers, and a separate page for Younger Next Decade: After Fifty, the Transitional Decade, and what You Need to Know.